Clerk to attend Committees, &c.
In respect of the Shortness of the Time of the Year, and Shortness of the Session, to appoint a Committee in general. Sir Henry Withrington speaketh in Defence of himself, for the Election. - He not Friend with the Sheriff. - Was not present:- - So saith nothing to the Proceeding. All the Privy Council of the House, Sir Henr. . . .
Mr. Duncombe: - To have the Privileges examined first, and openly; particularly, whether Mr. Attorney-general may be chosen (commending his Parts, Service, &c.) in respect no Precedent, that an Attorney-general chosen. - Writ of Attendance. - Sir H. Hobart's Case ruled, because then a Member of this House, when chosen Attorney. Mr. Alford moveth, that the House may determine, whether Mr. Attorney may serve. - Generally allowed a good Motion. Sir Roger Owen concurreth; [a] for that no Attorney ever Chosen; nor anciently any Privy Counsellor, nor any that took Livery of the King. - Precedents:- - 7 R. II. a Bannerett put out: - Per printed Authority; Sir Tho. Moore, in his Treatise, after he had been Chancellor and Speaker. Negative Argument; - never any Attorney. - Members of the House, chosen Barons, Judges, &c. dismissed: - New Choice. The full of his Motion: - The Privy Counsellors having got Continuance, to stay, for this Time; but now the Question to be, Whether Mr. Attorney shall now serve here. Hereupon the House calling to the Question; Mr. Speaker desired them to stay a while, to see whether any other would speak ; and then, being pressed to put the Question, desired to know the Pleasure of the House, if the first Question should not be. Whether the Question should be, without first a Search made of the Precedents. To which Exceptions were taken; telling Mr. Speaker, he ought not to divert the Question. Mr. Frauncis Moore, - against the Question now without Sight of Precedents. - No Questions made of Returns of others ; therefore this not to be questioned. Mr. Fuller: - We, in this Assembly, as a Body divided from the other House. - Mixture, by this Means, of both Bodies. - General Voice to the Question. Undertakers. - That he so saluted, though he cleared, by the King. 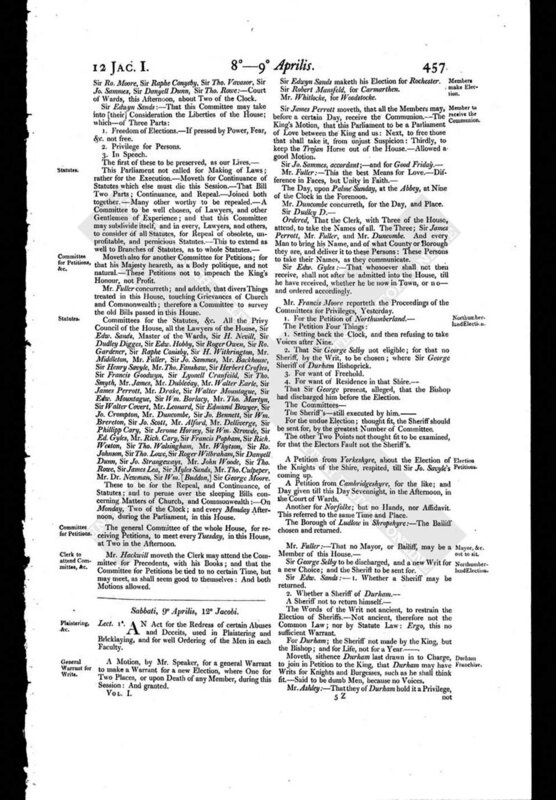 - Consent and Vogue of the House going one way, - knoweth the House will dislike his Motion.- - His Opinion, that the Attorney-general ought not to be of the House; nor any Attorney-general; yet desireth to have the Question deferred, in Satisfaction to his Majesty, for doing it gravely and discreetly ; and refer it to the Committee. Sir Rich. Willyamson, - for the Deferring of the Question, because no Precedents searched, or found, on the other Side. - Precedents, in the Prince's Case, One way, which then swayed the Law, which after changed. Mr. Amnerst: - For that divers new Parliament of the same Mind. Mr. Hackwyll: - Searched the Precedents, and, as he remembereth. Mr. Attorney hath been of the House; yet wishes it were not so. Mr. Finch.- - Inconvenient Mr. Attorney should be of the House ; but Precipitation dangerous, for cutting off a Member. - A Judgment, to dismiss him without Precedents, justum, non juste. Mr. Ashley: - A Committee only for Search of Precedents, whether any Attorney have been elected, and served as a Member of this House. - The Question, whether the Committee shall only consider, [and] search, of Precedents. And, upon the Question, that ordered; and committed to Sir Herbert Croftes, Mr. Alford, Sir Edw. Hobby, Mr. Hackwyll, Sir Henry Nevill, Sir Wm. Strowde, Mr. Whitlocke, Sir Roger Owen, Sir Rich. Willyamson, Sir James Scydamore, Mr. Fuller, Mr. Finch, Sir Jo. Sammes, Mr. Ashley, Sir Robert Gardyner, Sir Edwyn Sands, Sir James Lea, Sir Dudley Digges, Sir George Moore, Sir Edw. Mountague, Sir Tho. Rowe, Mr. Duncombe, Sir Rich. Weston, Sir Tho. Smyth, Sir Francis Goodwyn, Sir Francis Popham, Mr. John Drake, Sir Jerome Horsey, Mr. Backhowse, Sir Edmund Bowyer: - Exchequer Chamber. 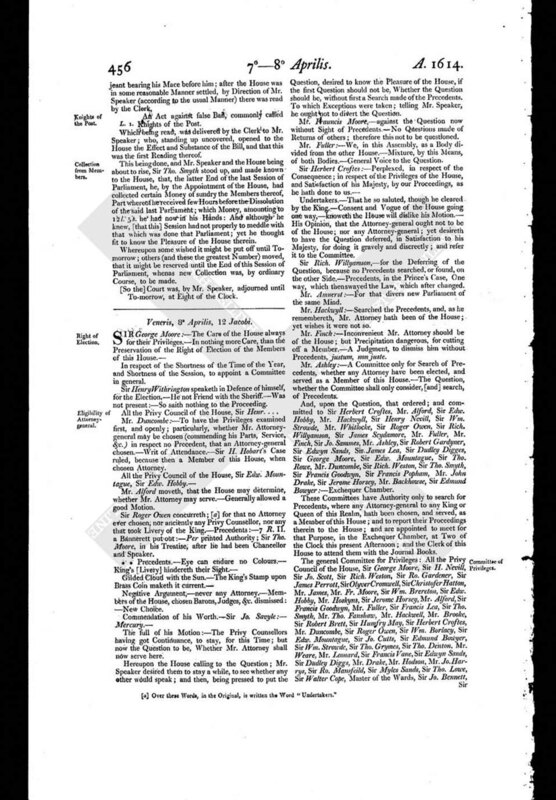 These Committees have Authority only to search for Precedents, where any Attorney-general to any King or Queen of this Realm, hath been chosen, and served, as a Member of this House; and to report their Proceedings therein to the House; and are appointed to meet for that Purpose, in the Exchequer Chamber, at Two of the Clock this present Afternoon ; and the Clerk of this House to attend them with the Journal Books. Sir Ro. Moore, Sir Raphe Conysby, Sir Tho. Vavasor, Sir Jo. Sammes, Sir Danyell Dunn, Sir Tho. Rowe. - Court of Wards, this Afternoon, about Two of the Clock. 1. Freedom of Elections. - If pressed by Power, Fear, &c. not free. Moveth also for another Committee for Petitions; for that his Majesty heareth, as a Body politique, and not natural. - These Petitions not to impeach the King's Honour, not Profit. Mr. Fuller concurreth; and addeth, that divers Things treated in this House, touching Grievances of Church and Commonwealth; therefore a Committee to survey the old Bills passed in this House. Committees for the Statutes, &c. All the Privy Council of the House, all the Lawyers of the House, Sir Edw. Sands, Master of the Wards, Sir H. Nevill, Sir Dudley Digges, Sir Edw. Hobby, Sir Roger Owen, Sir Ro. Gardener, Sir Raphe Conisby, Sir H. Withrington, Mr. Middleton, Mr. Fuller, Sir Jo. Sammes, Mr. Backhouse, Sir Henry Savyle, Mr. Tho. Fanshaw, Sir Herbert Croftes, Sir Francis Goodwyn, Sir Lyonell Cranfeild, Sir Tho. Smyth, Mr. James, Mr. Dubleday, Mr. Walter Earle, Sir James Perrott, Mr. Drake, Sir Walter Mountague, Sir Edw. Mountague, Sir Wm. Borlacy, Mr. Tho. Martyn, Sir Walter Covert, Mr. Leonard, Sir Edmund Bowyer, Sir Jo. Crompton, Mr. Duncombe, Sir Jo. Bennett, Sir Wm. Brereton, Sir Jo. Scott, Mr. Alford, Mr. Delliverge, Sir Phillipp Cary, Sir Jerome Horsey, Sir Wm. Strowde, Sir Ed. Gyles, Mr. Rich. Cary, Sir Francis Popham, Sir Rich. Weston, Sir Tho. Walsingham, Mr. Whytson, Sir Ro. Johnson, Sir Tho. Lowe, Sir Roger Wilbraham, Sir Danyell Dunn, Sir Jo. Strangeways, Mr. John Woode, Sir Tho. Rowe, Sir James Lea, Sir Myles Sands, Mr. Tho. Culpeper, Mr. Dr. Newman, Sir Wm. [Buddon,] Sir George Moore. These to be for the Repeal, and Continuance, of Statutes; and to peruse over the sleeping Bills concerning Matters of Church, and Commonwealth : - On Monday, Two of the Clock; and every Monday Afternoon, during the Parliament, in this House. The general Committee of the whole House, for receiving Petitions, to meet every Tuesday, in this House, at Two in the Afternoon. Mr. Hackwill moveth the Clerk may attend the Committee for Precedents, with his Books; and that the Committee for Petitions be tied to no certain Time, but may meet, as shall seem good to themselves : And both Motions allowed.